Baker Perkins has recently increased stock levels of most of its range of extruder screw parts in order to reduce delivery times. Greater quantities of the most commonly used elements are now being held and the range of stock items has been increased to include low-wear parts that were previously made to order. Stock levels are continually reviewed and updated to ensure rapid availability. Stock levels now cover the complete standard shaft configuration of every size of extruder in the Baker Perkins powder coating range, from the feed section through mixing, melting and discharge. This enables orders for full sets of screws, or only the elements that have worn, to be supplied ‘off-the-shelf’. Stock is held in the UK and USA to reduce delivery times even further. Parts will be available in every commonly supplied material, including those specified for high abrasion and corrosion resistance. Newly developed screw parts using the latest materials and profiles can be ordered from stock to improve throughput, and product quality. For example, new agitator elements are available to improve the feed section operation through an updated configuration; innovative paddle arrangements can solve process problems within the mixing zone; alternative materials offer longer life in high wear or corrosion situations. 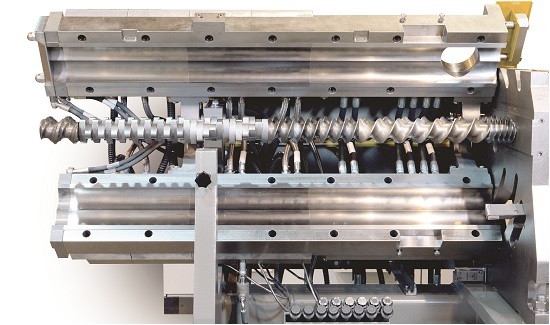 Baker Perkins offers advice over the phone or through site visits to optimise extruder performance for maximum effectiveness. We are also happy to provide a list of the most frequently required wear parts for each machine, and hold them in stock for immediate delivery. Parts that are specific to an individual machine or customer can be manufactured by arrangement and held on consignment until required. Extruder screw parts are made to the original specification and drawings. They meet precise profile and clearance criteria, are inspected to the highest quality standards, and can be fitted first time without adjustment or modification. Screw parts are inevitably subject to wear: buying from the original equipment manufacturer ensures maximum performance and service life. Baker Perkins extruders are suitable for all types of powder coating formulation, in outputs ranging from small batches to 2,900 kg per hour.